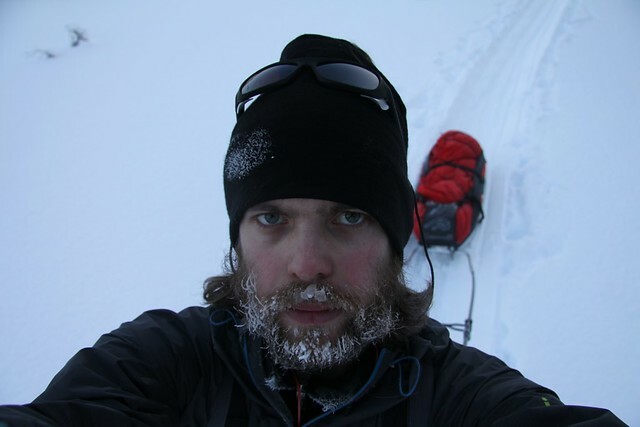 The second article on winter gear, and its about the Fjellpulken XCountry 130 Pulka. Yes, winter is over in the northern hemisphere, but our brethren in the south are facing the cold time of the year, while we will lounge in the sun and enjoy the light for 24 hours! It also allows us to get winter gear with nice discounts ;) So read on to hear about a serious piece of winter gear! Your first question might be why I didn't build myself an incredible Rulk but went for a commercial pulka. The answer is that I am already standing out enough with my UL gear at school, and I didn't want to push the boundaries too far, and had only a limited amount of time. That made me look for commercially available, lightweight pulkas. Being in Northern Europe, that means looking at what our Finnish, Swedish and Norwegian companies have to offer. I found what I was looking for at Fjellpulken in Norway. Some more research showed that the Finnish Distributor Hjorth has his office ten minutes from where I live; after a phone call we arranged that I pick up a pulka for loan for a few trips for them and return it afterwards. The important bits: A weight of 4,5 kg, it is 130 cm long, 43 cm wide and has a capacity of 235 liters. Yes it is huge! 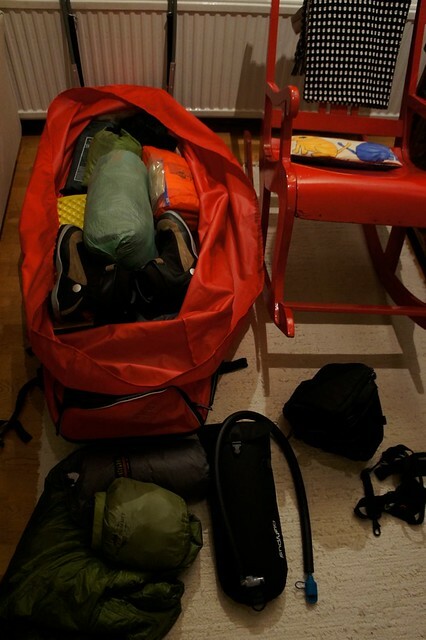 When fully packed, evenly, the average height is around 40 cm, though you can go as high as 80 cm as I have tried. On top of that comes the weight of the pulling beams (about 1900 gram) and the harness (345 gram), so you look at a total weight which is slightly under 7 kg. That looks a lot, but it allows you to carry a lot of gear - 40 kg of food and equipment would be no problem and can be pulled very comfortable. The Pulling Beams and Harness. Lets start with a look at the pulling beams and the harness. The pulling beams are Fjellpulken's basic model, which is a collapsble, strong, and high-quality parallel shaft that has a built-in cushioning spring. The latter is really nice, as it minimizes the bouncing and pushing in your back you get without them. It folds in half and you turn it back over the pulka, making the whole package very compact for transport. 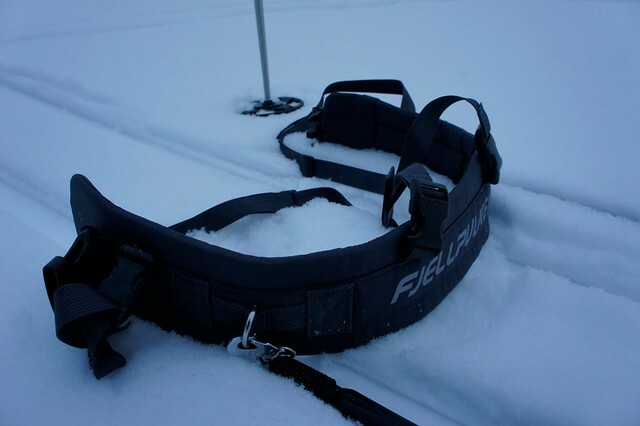 The harness is Fjellpulken's standard pulk harness, which comes with crossover straps, is made from nylon and features a padded hipbelt. Comfy and sits well, easy and quick to put on and off. Easy access via the big zipper in the back. 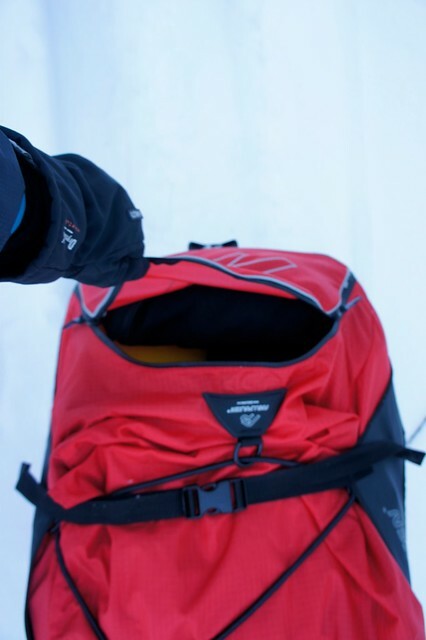 I also have the Fjellpulken 20 litre backpack with integrated harness - but I haven't tried it; maybe next winter. I did try a cuben fibre backpack while pulling the pulka, but found the best comfort for me is to only wear the harness and have everything in the pulka. A disadvantage of this arrangement is that I need to get my snacks and water from the pulka, so need to ski a few meters back. But it is not a big problem, as it also allows me to sit down on the pulka and rest for a moment. The pulka itself then. It has an extremely well-gliding bottom material, and creates an ace track for people skiing behind you - a big bonus when travelling in a group. 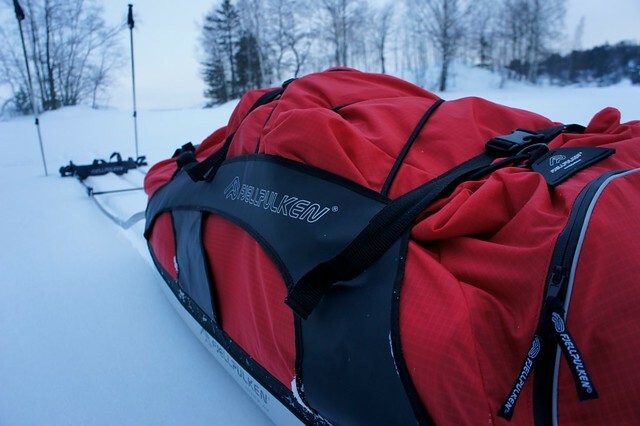 The integrated tarp is waterproof, and keeps your gear safe and dry from snow. You secure the top via elastic cords which are hooked into the opposite cord, and secure the whole package then with buckles. In the front there's also a small pocket, I kept the skins for my skis in there for quick and easy access. In the back there is a zipper which allows you get at the packed stuff; I kept my thermos and water bottle, together with my puffy jacket and snacks there to quickly get to them. While it ain't super wide, it distributes the weight very well (as well as you packed it, obviously - heavy stuff towards the back, light stuff in the front!) and hence floats even when packed with 25kg or more with ease over powder snow and tracks alike. Going uphill is as easy as it is for you to ski uphill. I found a diagonal approach best where possible, but little hills like those in Finland even can be tackled full-frontal. Going down is thanks to the stiff pulling beams also less dangerous - no worries that the pulka will crash in your back, as it could be the case with lines. My limited experience showed me that going full throttle down is the most fun, fastest and quickest route. 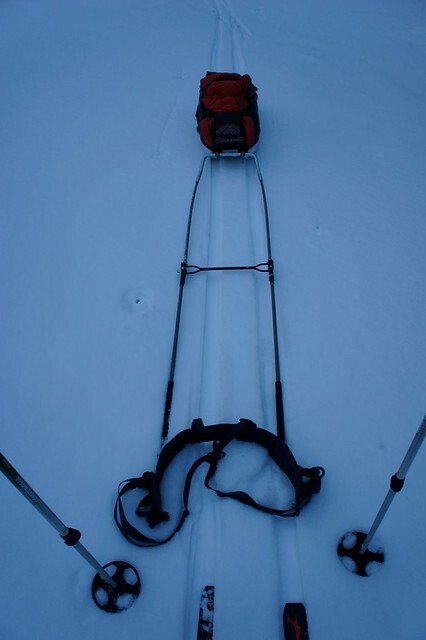 You could take the diagonal approach again, but then you need to master the breaking-on-skis part particularly well. Gear fully secured and wrapped up. 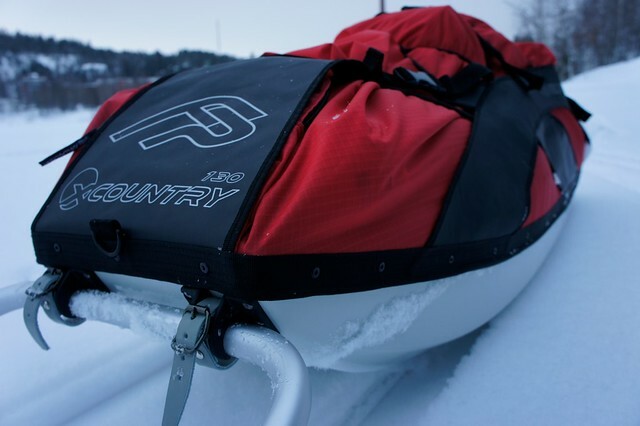 The black fabric on the side helps to keep the gear in place, and is also a handy place to put your skis, snowshoes and poles under when travelling. Speaking of travelling, I travelled via train and bus with the pulka and skis, and it worked like a charm. It is so easy to pull all your gear through the city when everything is covered in snow, and lifting it via the belts on top or the side fabric is also no problem. It is also a sure conversation starter when you stand around somewhere! So all in all a really nice piece of gear. It allows you to go on 14+ day winter trips without resupplying, as the Fjellpulken XCountry 130 will hold a massive load of gear and supplies. You could try to put that much gear into a backpack, but I seriously doubt that it would be comfortable or allow you to travel any significant distance. 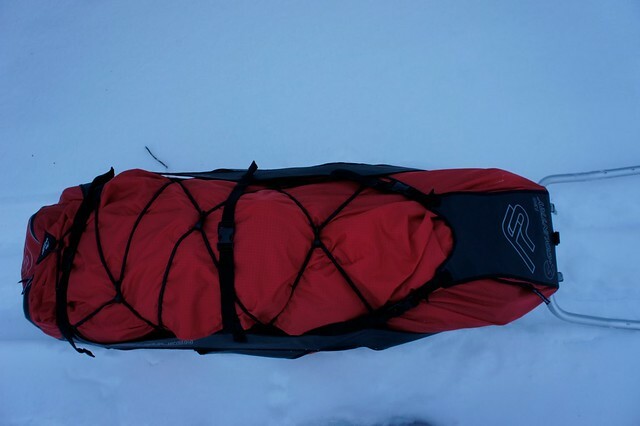 And while this might look like I forgot about lightweight principles, the main reason I got a pulka was to try to adhere to some of the Wilderness Guide school's ideas for winter travel. And it is, in all honesty, a pretty nice tool, such a pulka. You could, for example, with ease carry one of the Titanium Goat or Four Dog Ti stoves to heat your shelter, and have a very pleasant time outside in winter! 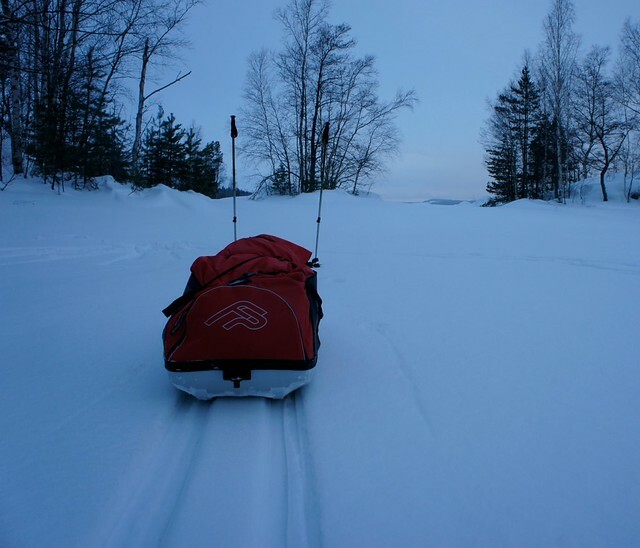 While a pulka is a tool for serious winter adventures, I have seen people load them up with a masses of food and drinks for an winter overnighter! Which goes to show that your imagination is the limit! Fjellpulken also makes pulkas in which to pull your kids - a friend has such a model and reports that his offspring found it a delightful way to travel - for a while, at least =) For more photos, head over to the Flickr Album. Fjellpulken XCountry 130 Pulka in action. 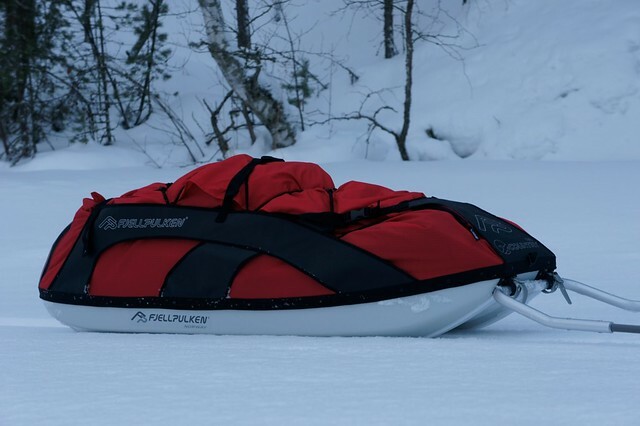 If you're living in Finland and want to try a winter adventure with a Pulka, have a look at the Varuste.net and Scandinavian Outdoor Store, they both also send abroad and have great offers on it at the moment! If you own an outdoor shop in Finland and want these Class A pulkas in your sortiment, contact the friendly folks at Hjorth, the Finnish Distributor, to discuss the matter.